I'm on the mission to tell the world about all those gorgeous fruit & berries we are eating here in Estonia ;) Flowering quinces. Lingonberries. Bilberries and bog bilberries. Cloudberries. Wild strawberries galore. Yet the list is not complete yet. Here's something new, something that has taken Estonia by storm during the last decade or so. Something I doubt very many of you have eaten or maybe even heard of. Let me introduce you to Sea-buckthorn (astelpaju in Estonian). I've mentioned it on my blog previously here and here; for some weird reason I never told you about those three delicious sea-buckthorn cheesecakes I made last Christmas. 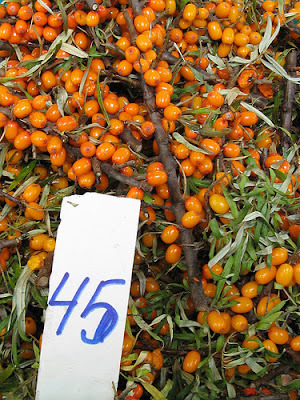 Sea-buckthorn berries can be turned into jam, jellies, fruit wine, sweets, and juices and cordials (both are very, very popular here). In Central Asia the fruit are eaten with cheese and milk. The tart berries can also be used to season fish and meat dishes, just like lemon juice. I wanted to make something that had been in my mind for a while - a combination with kama. 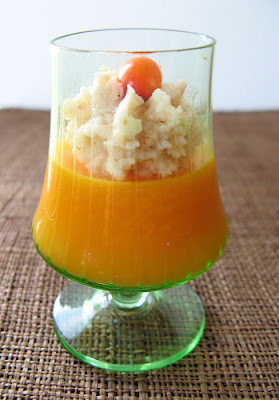 After all, I've sent kama to so many of you that it's my obligation to provide you with new recipes for that roasted grain mixture :) This is a great recipe to showcase kama - the sea-buckthorn jelly has a tart and slightly sour flavour that is a good companion for a creamy-grainy mascarpone and kama mousse. And a wonderful colour to boot!! Sea-buckthorn trivia: 'tyrni', as sea-buckthorn is known is Finnish, is the official plant of Satakunta region in South-West Finland. (You can read much more here, only in Finnish, however). For the jelly, you need 300 ml sea buckthorn juice. You can either use shop-bought good-quality sea-buckthorn juice, or make your own. To make your own, wash the berries (put few berries aside for garnishing) and puree in a blender. Press through a fine sieve. Then take some boiling water and pour over the sea-buckthorn pulp on the sieve to extract more juice. Continue, until you've got 300 ml liquid. (Using boiling water helps to extract more 'juice matter' from the pulp). Soak gelatine leaves in cold water for a few minutes. Meanwhile, heat about 100 ml of the sea buckthorn juice to about 70 C, then drain and press soaked gelatine leaves and add to the heated juice. Stir, until dissolved, then add to the rest of the juice, stir, and pour into four dessert glasses/bowls. Place into the fridge for a few hours to set. For kama-mascarpone mousse, cream mascarpone with a wooden spoon or electric mixer until fluffy, adding sugar to taste. Add a spoonful or two of kama mixture, depending on your taste again. You may also add some single or whipping cream to the mixture, to make it lighter. 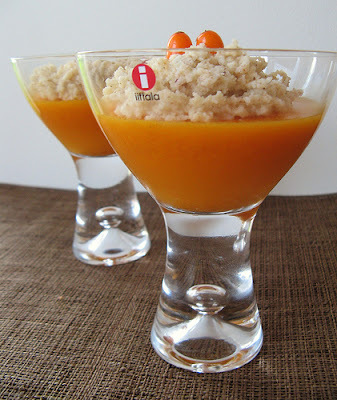 To serve, spoon some kama mousse onto set jellies, top with whole sea-buckthorn berries. sounds so delicious and healthy! thanks for introducing me to the sea-buckthorn berry! I love tart berries... actually, berries of any kind. It's the only thing I'll give up chocolate for. And you know I'm getting into kama! Another type of fruit I've never seen or heard of! It sounds so wonderfully nutritious too. Great photos. I love learning about all of these wonderful berries. I hope some day I'll be able to visit Estonia and taste them. I have never heard of this berries before - but I must say two words caught my eye - mascarpone mousse. This looks delicious , Pille. i LOVE your iittala glasses! Pille . . . do lingonberries come in a little paper-like husk, like tomatillos? One of my regulars at the farmers' market gave me a taste of that type of fruit a couple of weekends ago that I'd heard of but never seen, and I can't remember if it was lingonberry or not. You've just solved a mystery for me. I used to see sea buckthorns in the market in Finland and could never ever figure out what their English name was! Thank you! I've discovered sea buckthorn only recently, while on holiday on a German island on the Baltic sea and I enjoyed very much having sea buckthorn in different forms in desserts while there. Their German name is Sanddorn, and in French the tree is called argousier. Sea buckthorn juice is available in some "health" shops or supermarkets specialised in organic products in other parts of Germany. To Rachel: I buy it from Selver, but I'm sure Kaubamaja and Stockmann and the other large supermarket chains also stock it. Katie – I bought two mini versions of those glasses today J And I’m so very pleased to hear that you like kama! Tuuli – welcome to Nami-nami! I haven’t had a chance to try talkkuna myself yet, but from what I’ve read, I believe you can use one or the other. Kalyn – it’s nutritious and refreshing. I had a sea buckthorn cocktail in a café this morning – simply frozen berries blitzed with some water and then strained. Very delicious! Lydia – I hope some day I’ll be able to show you around in Estonia! Trig – you may find sea buckthorn juice extract in health food shops, but I doubt fresh or frozen berries will be easily available..
Hilda – you’d definitely like it then. I know that some Finnish chefs use sea buckthorn juice instead of lemon juice to get that necessary citrussy flavour. Swirlingnotions – no, they come as berries, as you can see on the photo above. Lingonberries don’t come in husks either. The only thing I can think of (apart from tomatillos) are physalis fruit alias Cape gooseberries. Wendy – I’m glad I could be of help! Veronique – it’s good to know it’s available in Germany. And thank you for the German & French translations! Rachel – as Jaanika said, it’s pretty widely available here. Look at the dairy aisle. Stockmann usually stocks 3-4 different brands, including one local. Jaanika – aitäh abi eest! Hi, I found a few tips to get rid of various skin problems like acne, eczema, rosacea with the help of Sea Buckthorn Oil...Please do have a look on it!